Send money to a @username. No more struggles with cryptic addresses. At Byteball, we believe simplicity is beauty. Easy-to-use apps are the way to introduce wide audiences to new technologies. Today the @username concept is familiar to everyone. We use usernames to bring a personal touch to our online identities on platforms with hundreds of millions of monthly users such as Reddit, Telegram and Twitter. Usernames are everywhere, and people love usernames. Unfortunately one place where there are millions of people but a lack of usernames is the cryptocurrency sector. Instead of beautiful, short, sweet and meaningful usernames, virtually all cryptocurrency projects only use cryptographic wallet addresses. These addresses are long, ugly, meaningless and cannot be remembered (by most normal humans anyway). More importantly, these wallet addresses are hurting adoption. We are pleased to announce that today, Byteball is making another release to help with real world adoption. Want to receive payment @markzuckerberg instead of UEN4Z6AW3MAFPNSLYOIQELMIOAWW6W7K? From today, you can do that with Byteball. Want to receive payment at @dagwins instead of UEN4Z6AW3MAFPNSLYOIQELMIOHYE6W7K? Again, you can now do that with Byteball. We think you understand the concept. No need to share your wallet’s address prior to a transaction. No need to worry if the sending party gets it right. Besides, it’s much easier to read your transaction history and know “who-is-who” on the list. The @username option is a user-friendly feature and a must have on the way to mass adoption. 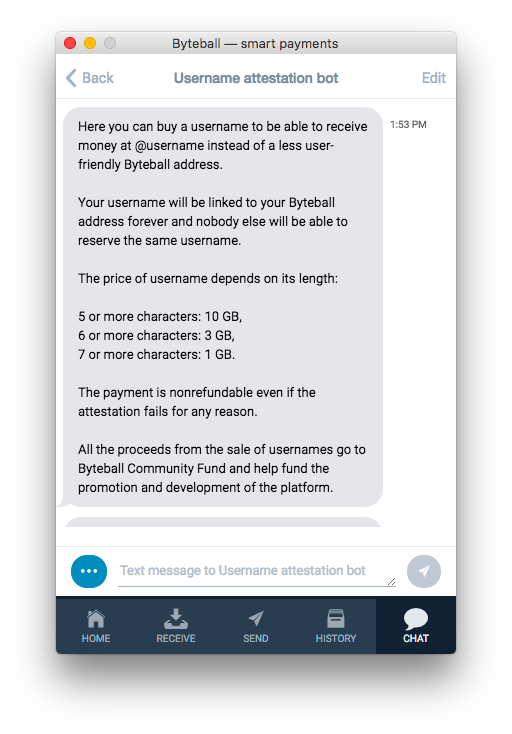 Like most applications on the Byteball platform, the @username registration feature is implemented as a chatbot. All you need to do is find “Username registration bot” in the Bot Store, select your language, choose a wallet you want to name, type your username, and confirm the payment in GB. Easy and fast. That’s what users demand in the real world, and cryptocurrency needs to be the same to get wide adoption. We want the prices to be fair and reasonable to allow loyal community members to choose from a variety of options. At the same time, we don’t want to make them too cheap to prevent usernames from being easily hoarded by only a few users. and a 7+ character name can be had for just 1 GB. Shorter names are not on sale yet and, as usual, the prices can change in the future (likely increase). There can only be one @username per address and you can have up to 5 usernames per device. It’s worth pointing out that all the proceeds from the sale of @usernames will go to the Byteball Community Fund and will help fund further development and promotion of the platform. Buying a username could be considered a great way you can contribute to Byteball community and its growth. It is not the first step towards making smart payments as simple as possible. 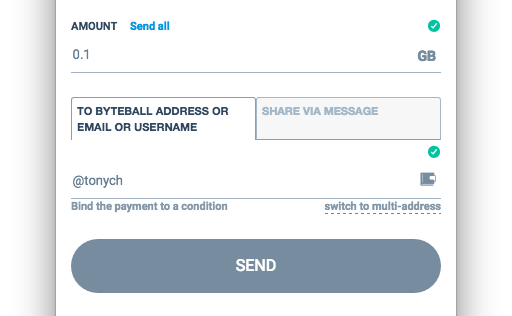 Since last year Byteball users have been able to send money to an email address even if the recipient doesn’t have a wallet yet using the Byteball textcoin feature. Coins can also be sent through text message, Whatsapp, Telegram, Viber, WeChat, or any other chat app. The textcoins can also be used for sending anonymous cryptocurrency BlackBytes. Though textcoins are far not the only friendly feature released previously by Byteball team. In March 2018 we launched the email attestation bot, that enables sending and receiving money directly to attested email addresses in Byteball wallet. And since Steem integration was announced all Byteball issued tokens can be sent to steem/username. Now the @username feature is yet another step to reaffirm Byteball leadership in ease of use among crypto platforms.